If you love BBC Classic Drama, Jane Austen, Georgette Heyer, 18th Century history, or romances with plenty of wit and adventure then dive right in! You’ll find a world of determined heroines and heroes, an eccentric character or two, and a weave of subplots to keep things interesting. Ms. Brant has agreed to take us back to an important fashion statement of the Georgian Period: the shoe. We women love shoes. We purchase them even when we do not require a new pair. If the Shoe fits… But does it? 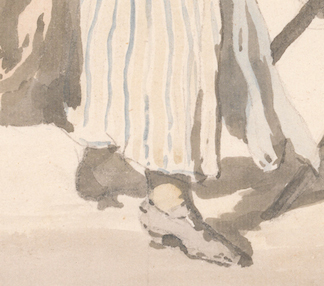 The Shoe—a most trivial subject for study in the 18th Century. Is there anyone who doesn’t love shoes? I do, especially shoes as an art form, and as an historical artifact because they define a particular era. I can appreciate the fashionable high- heeled shoe, though I have never worn one, and love shoes with exaggerated pointed toes, despite a pair cutting off the circulation to my big toe. 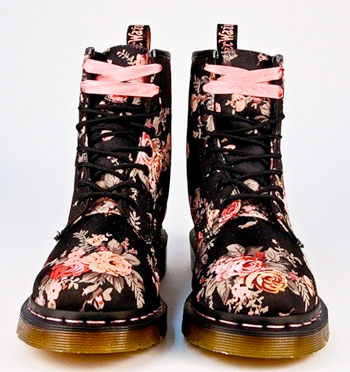 I also own a pair of Dr. Martens boots with their heavy rubber sole and flowered canvas tops. They were too tight across the bridge of my foot and took weeks and weeks of “wearing-in” before they were anywhere near comfortable. But I still wore them until they were “worn in,” regardless my eyes watered every time, and I had blisters. We all do it, men as well as women—often wear shoes that are not healthy for our feet, and all because the shoe looks good, or are the latest fashion, or we want our Size 10s to look smaller than they are. At least today there are alternatives, varieties of shapes and sizes, materials and widths. Healthy feet are an aspiration if not an outcome. 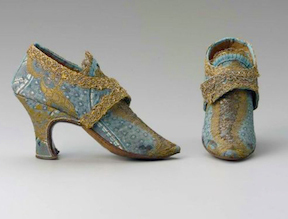 The shoes I love most are the high heeled shoes of the 18th Century, introduced by the vertically challenged Louis XIV, who ordained his courtiers, both male and female, wear heels at Versailles. 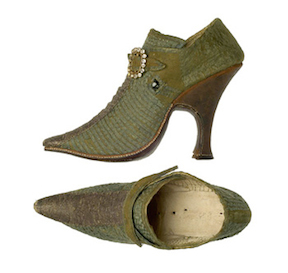 High-heeled metrosexual shoes worn by the 18th century aristocracy, both in France and England, were unobtainable and exotic for the vast majority of the population. Extreme in form and in materials, they were high, pointed and made from leather, silk, damask, wool, etc., embroidered with silver and gold thread, with a two inch heel or higher that sat forward of the heel. They were completed with a shoe buckle covered in diamonds, or paste thereof, that offered evidence of the societal position and wealth of the wearer. But how much thought if any did the Georgian wearer, rich or poor, give to the health of his or her feet in relation to the shoes they were wearing? What discussion, if any, was there about the construction of a shoe in relation to the anatomy of the foot? The answer may surprise you; it did me! These questions and more about shoes cropped up while I was researching disability in the eighteenth century for my latest novel. I came across a most fascinating little treatise entitled On the Best Form of Shoe, by a remarkable man Petrus Camper (1722-1789) Professor of Medicine, Surgery, and Anatomy, at Amsterdam and Groningen. On the Best Form of Shoe originated from a jest. Camper wished to prove to his anatomy students that any subject, however trivial, might become interesting if discussed by someone who was knowledgeable of both causes and results. Whether it was Camper or one of his students who gave him his subject matter, the shoe was decided upon as the most trifling of subjects for study. But what Camper discovered from his in-depth research led to some surprising conclusions, some of which are still relevant today. Camper’s first observation was that while there was much research and debate through the ages on the feet of horses, mules, and oxen and what constituted an appropriate shoe for a beast of burden, humans had almost entirely neglected their own species when it came to knowing anything about the human foot. And while a farrier might know intimately the hoof of a horse, how to care for it and how to correctly place a shoe upon it, a cordwainer (shoemaker) made shoes in ignorance of the anatomy of his own feet. Shoes were not made for the foot; shoes were made for what Camper described as “the absurdities of fashion and the depraved tastes of the day.” Sound familiar? 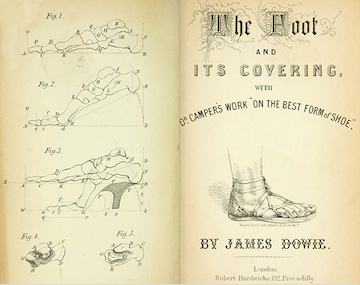 James Dowie, a practical and scientific Scottish cordwainer of the Victorian era, included an English translation of Camper’s treatise on shoes in his own publication The Foot and its Covering, 1861, supporting Camper’s observations of a hundred years earlier—that cordwainers knew so little about their own feet, and nothing about the anatomy of the foot. Dowie was amazed that this was still the case in late Victorian Britain and was forward thinking enough to send the 26 cordwainers in his employ along to a lecture on the anatomy of the foot at the Surgeons Hall in Edinburgh; all came away with a dawning revelation that shoes should be made to fit the foot. Wow! Mind blowing stuff! Twenty years later, in 1884, Ada Kemply observed in her piece for Popular Science “Fashion and Deformity in the Feet,” that shoes were primarily made to satisfy fashion and with no thought as to the consequences of such fashionable styles on the feet, and that this led to widespread deformities. Kemply concluded that “One cannot treat the deformities of the feet without considering the nature of their covering” and that boots and shoes “cramp, distort, and disable” feet. Camper used the term “victims of fashion” to describe persons wearing a particular shoe form, not for comfort, but because it was the fashionable thing to do. He voiced the hope that enlightened parents would avoid inflicting “torture” (his word) on their children by allowing them to wear shoes that fit their foot for comfort, and he praised those forward-thinking parents who allowed their children to go barefoot in the house, thus allowing their growing feet to form naturally. You can imagine Camper shaking his head at so called enlightened European society who bestowed compassion on the fate of Chinese women who had their feet dislocated and wholly misshapen by the tradition of foot binding, and who call this practice barbarous, and yet they condemned themselves to a lifetime of discomfort by squeezing into shoes with shapes and sizes wholly inappropriate for their feet. 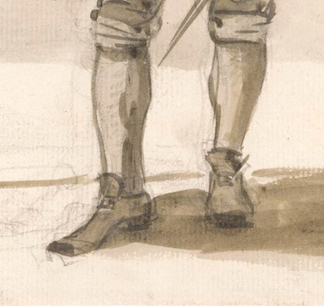 Riello in his Ph.D. thesis concurs, saying that in 18th Century France, as in England, the young and fashionable in particular were of the opinion that unless their boots and shoes fit very tight and exact, they were “not proper for any genteel person to wear,” and that the skills of the cordwainer were measured in relation to “his ability to produce shoes that make the feet appear particularly small,” which was the fashion for women of the 1700s. Camper considered the poor wiser than their social superiors when it came to appropriate footwear. Not dictated to by the whims of fashion, the poor wore sturdy shoes with a low heel that allowed for a firm gait and the ability to walk with ease. However, the stiffened leather, and the fact shoes were made on identical lasts (the template of the foot for shoemaking purposes), meant that many of the poor, too, suffered foot problems such as corns and blisters. To counter the problems arising from ill-fitting shoes, Camper recommended all shoes be made using a right and left last. A recommendation that today is patently obvious, as both feet are shaped differently. Although there is evidence of shoes being made in pairs specifically for the right and left foot in earlier centuries, cordwainers during the 1700s used identical lasts for both feet. Needing only one last was much more economical, and it was assumed that with wear, the shoe would mold to the wearer’s foot. Yet, in many cases this did not happen, either due to the stiffness of the leather or because it only occurred near the end of the shoe’s usefulness, and by then the health of the feet had deteriorated, sometimes beyond repair. Camper’s treatise included a chapter on club feet and through his scientific observations and findings concluded that such a deformity was unlikely to be corrected by the use of the wooden and steel contraptions of correction available at that time; footwear, like those for the normal foot, should be made specific to the shape of the foot itself. Professor Camper’s findings were so remarkable for the time that On the Best Form of Shoe was translated from the Dutch almost at once and often, and into several European languages. As stated previously, it was considered worthy of reprint up to as late as 1861, being included in Dowie’s publication The Foot and its Covering. Even today, Professor Camper’s scientific study of the shoe makes interesting reading, and much of what he says on the reason particular shoes are worn, not for comfort, but because it is the fashionable thing to do, and the unhealthy consequences on our feet that arise from such choices, can easily be applied to us. Hands up all those who wear a particular shoe because it is fashionable. Hands up all those who wear high heels. We are fashion victims one and all, so says Professor Camper. Lucinda Brant is a New York Times and USA Today Bestselling author of Georgia n historical romances and mysteries. Her latest Georgian historical romance, DAIR DEVIL, Book four in the Roxton Family Saga series, is now available at all eRetailers. Always the observer, never the observed, her fragility hides conviction. She will risk everything for love. London and Hampshire, 1777: The story of Alisdair ‘Dair’ Fitzstuart–nobleman, ex-soldier, and rogue, and Aurora ‘Rory’ Talbot–spinster, pineapple fancier, and granddaughter of England’s Spymaster General, and how they fall in love. To jump into the 18th Century (there’s a whole board on fabulous shoes! ), follow Lucinda on Pinterest. 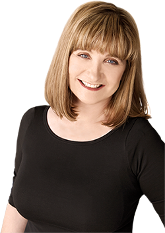 For more about Lucinda and her books visit her website. **Giorgio Riello, The Boot and Shoe Trades in London and Paris in the Long Eighteenth Century, PhD thesis, University College London, 2002. This entry was posted in British history, customs and tradiitons, fashion, Georgian Era, Great Britain, Living in the UK, royalty and tagged Ada Kemply, cordwainer, Dair Devil, fashion, footwear, Georgian Era, James Dowie, Lucinda Brant, Petrus Camper, shoes. Bookmark the permalink. I loved the post, Lucinda. I have only encountered a few situations where my heroine’s shoes would make a difference in the story line. The one I am currently writing, Angel and the Devil Duke, holds one of those incidences. Loved the post. I wear shoes for comfort. That said, I usually only buy shoes in Europe. American shoes are too narrow. Fortunately, my shoes last for years. Very interesting, Ella. I never thought about the differences in the toe box of the shoes found in Europe as opposed to those in the States. I love the extensive research on shoes and how even today it can still be applied to us to at least some extent! It is wonderful to know women have always been women – they are a very particular breed. LOL! How interesting! I indulge my love of shoes by being an artist & making ceramic versions. I can go totally overboard with detail & decoration but they are purely for gazing at & not wearing!